I used NodeXL to search, scrape, and collect the pattern of linkages in tweets using the #dayofarch hashtag. I then exported these to a .net file, and used Gephi to visualize and study the pattern. The dayofarchaeology_tweets file is a zoomable svg/pdf showing the full pattern. There are 454 nodes (individuals) connected by 993 edges (co-mentions, links, RTs, etc). The diagram’s colors indicate degree – the blacker, the higher number of connections. Top three users: lornarichardson, portableant, dayofarch. 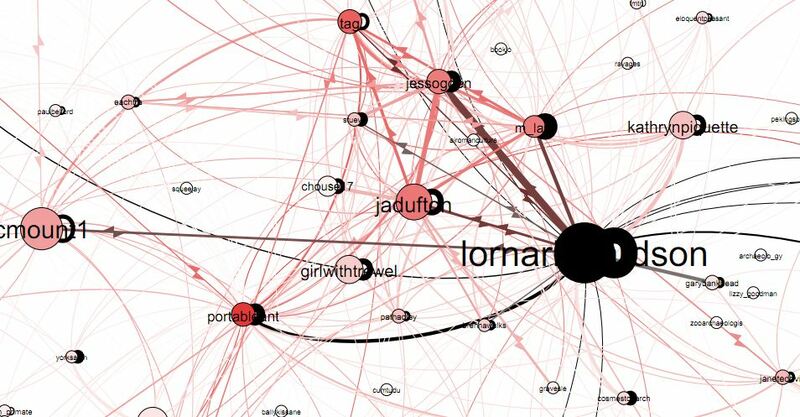 The size of the node indicates betweeness centrality – in this case, the users who tie together the twittersphere (in that they lie on top of the most paths connecting any two pairs of users). Top three: lornarichardson, cmount1, jadufton. The network diameter is 13, meaning that the longest path between any two users is 13 jumps; the average path length is about 5 jumps.